Transparency International is a well known civil society organization which struggle against corruption. 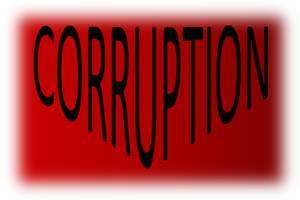 Its missions is to create change towards corruption free world. It was established in 1993. Its international secretariat is in Berlin, Germany while its Pakistan office is in Karachi. TI publishes CPI (Corruption Perceptions Index) annually. CPI is formed by countries' perceived level of corruption determined by surveys and experts evaluations from 0~10 while 0 shows highly corrupt and 10 shows very clean. In 2011 Transparency International measures CPI for 183 countries around the world. Pakistan scored 2.5 out of 10 and ranked at number 134 from 182 countries. Bangladesh, India, China and Iran have better ranking as per CPI 2011 report. 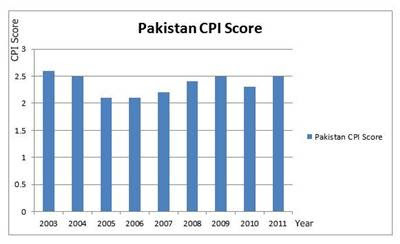 Following table and graph shows Pakistan ranking on CPI in previous years. Above graph shows that Pakistan's ranking is better than 2010. It was also 2.5 in year 2009 and 2004. Score was at its peak in 2003 while lowest score was seen in 2005 and 2006. New Zealand, Denmark, Finland, Sweden, Singapore, Norway, Netherlands, Australia, Switzerland and Canada are Top 10 Corruption Free Countries. US on 24 , UAE on 28, Saudi Arabia on 57, Turkey on 61, South Africa on 64, India on 95, Bangladesh & Iran on 120, Pakistan & Lebanon on 134 and Russia on 143. According to TI's CPI 2011 Somalia, North Korea, Myanmar, Afghanistan, Uzbekistan, Turkmenistan, Sudan, Iraq, Haiti and Venezuela are the Top 10 Corrupt Countries of the World. Note: High Score means less corruption while Higher Rank means more corruption.